(1) O give thanks unto the LORD; call upon his name: make known his deeds among the people. The phrase “to call upon” can refer to a few different ideas. It can mean “to invite”, “to call for help” or “to proclaim publicly”. Any of these three can flow from a heart of appreciation for the Lord. Do we invite our Lord to use His spirit to control every aspect of our life? Do we invite Him to come and use us as He sees fit? These are ways for Christians to express our thanks for all He has done for us. Do we look to our Lord in times of need? Do we refuse to take the “easy way out” of problems, but instead, ask the Lord for grace to help us do what is pleasing and honorable to Him in any given situation? If so, we are saying “Thank You” to the Lord for all He has done for us. Do we unashamedly tell others about our Lord and who He is? When the opportunity arises, are we willing to risk our relationship with a loved one or a friend to share with them their sinful condition, their inability to save themselves. and their desperate need of Christ? When we do these things we are declaring our gratefulness to Him through self-sacrifice showing His love to others. The second way that we can show our appreciation for the Lord and all He has done for us is by telling others what He has done for us. Not only His death on the cross for our sins, but the very personal things He has done for us during our lifetimes. The times He intervened by grace and healed our bodies (or our broken hearts), the times He protected us during times of danger, and the times He accompanied us through the storms of life granting us peace and enablement. All of these are important messages that others need to hear from us, as they face many of the same issues that He has already brought us through. In doing so, we are declaring our thankfulness for the Lord and all He has done for us. Not only are we to rehearse His greatness to others, but also we should display our thankfulness to Him by telling Him what He has done for us. In doing so, we are forcing ourselves to notice His acts of grace in our lives and humbles us It reminds us of our shortcomings, inabilities, and our continual need of Him. As we pray, we can speak to Him from hearts of gratitude and need throughout the day, constantly reminding ourselves of all He has done for us. By doing this, we are showing ourselves that we do recognize our indebtedness to Him and our need to constantly hold a spirit of gratefulness. (3) Glory ye in his holy name: let the heart of them rejoice that seek the LORD. We are to be encouraged and strengthened when we think of His holiness, his character, and the privilege we have been given to serve Him. We are not to be motivated to serve Him for the praise of men, but simply to see our Lord be glorified and honored in us. That is what has been; currently is; and, by God grace, will continue to be the desire of our hearts… to say thank you to the Lord for all He has done for us by declaring His greatness. And through it all, to lead men to Christ for salvation and to place a greater reverence of the Lord in the hearts of His people. Secondly I would just like to thank all of you who have so faithfully taken part in the ministries here at SIH…. Thanks to the followers, commenters, likers, visitors, readers, rebloggers and social site sharers. Believe me, you all have been a great human encouragement as we have sought to faithfully post on a daily basis. Thirdly, please be in prayer for the ministries here at SIH. By God’s grace, over the years we have tried to be constantly adding to our ministries in an attempt to reach the most number of people with His Word. MAY THE LORD BLESS YOU AS YOU STUDY HIS WORD! Beginning in 2016, readers will no longer be able to post comments to this site. This change is being made to facilitate the handling of comments being received from the increasing number of SIH internet sites. In your email please include the site name and lesson title. You will receive a personal response ASAP. 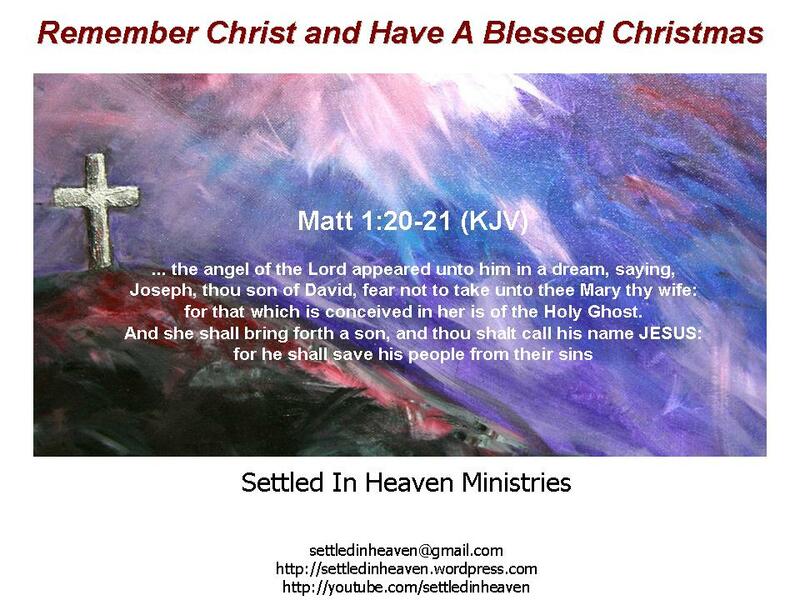 Thank you for your continuing interest in the ministries of Settled In Heaven. Please be in prayer for these ministries and the continuing expansion of SIH throughout 2016. Look for future announcements of new sites where the SIH ministry will be available. May the Lord bless you as you continue to study His Word! We always welcome any comments, questions, or suggestions that you may have. Lord bless you as you study His Word! 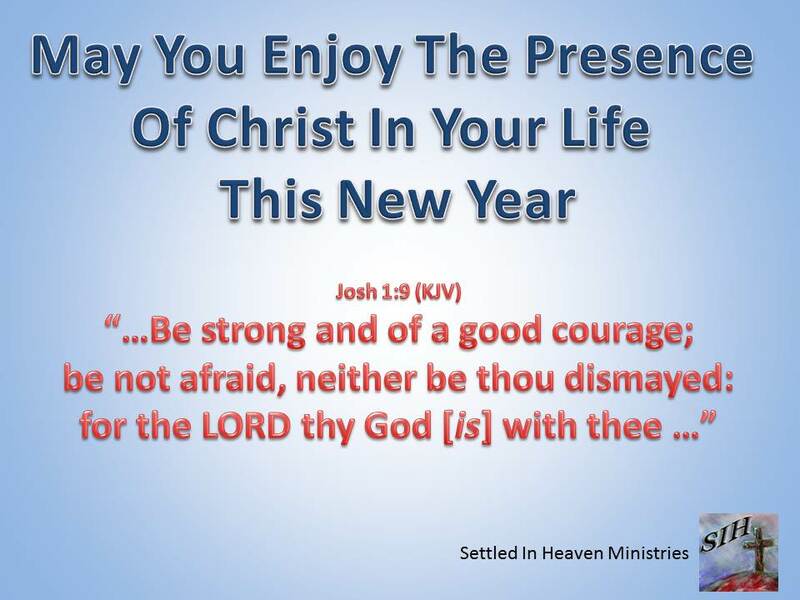 December 31, 2014 8:00 pm / 12 Comments on Happy New Years For Settled In Heaven Ministries! Christ Or Santa Claus? Man Am I Confused! Should Christians Participate In The Christmas Celebration? Happy Thanksgiving From SIH Ministries! November 27, 2014 10:00 am / 7 Comments on Happy Thanksgiving From SIH Ministries! Be Blessed, Safe, And Loved On This Day That Is Set Aside To Meditate On The Lord And His Goodness To Us! You Have Been, And Continue To Be, A Source Of Great Encouragement To Us! For all the new followers of SIH blog…We previously posted a series on the Bible’s teachings concerning different aspects of the world’s celebration of the Halloween holiday. Well worth the time to read/listen to the series. It better helps us to understand our responsibility as Christians when we are invited to the season’s celebrations. And be sure to answer the poll question at the end of part #1! 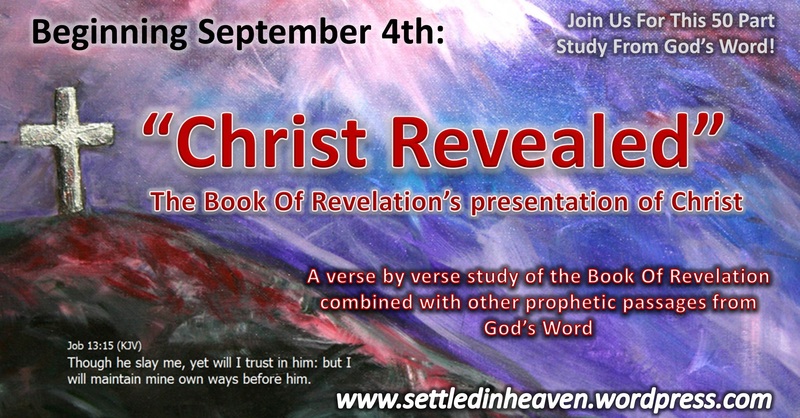 Please Join Us As See Truths About Christ Revealed Throughout The Book Of Revelation. Coming This Fall To Settled In Heaven Ministries…. August 2, 2014 8:00 am / 10 Comments on Coming This Fall To Settled In Heaven Ministries…. 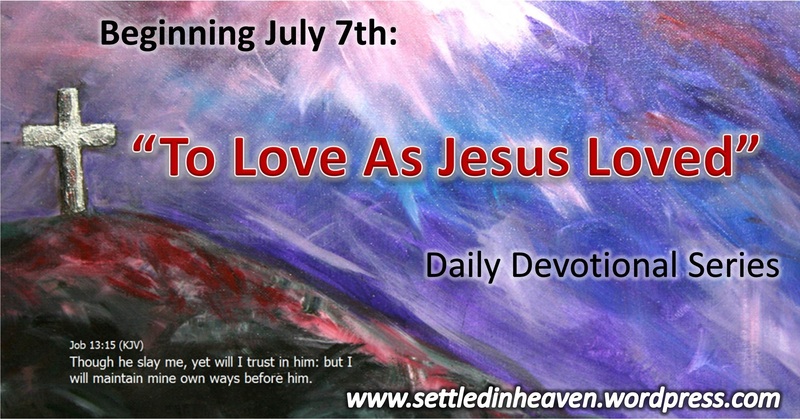 This devotional series will center on the life of Christ, His teachings and His works, as He set the the perfect example for us to love God and love others. This series will continue every Monday – Friday for the remaining portion of Summer and early Fall and will be presented in both text and video formats. Come join with us as we begin our new devotional series on Monday, July 7th!